Wild Joe's Beef Jerky is a brand of Wild Joe's, Inc., based out of Cincinnati, OH. The brand has been on the market since 1990. It's a family run business headed by Joe Lachenman who oversees the marinades and seals the packages. His wife does the marketing. Joe previously operated some butcher shops in Northern Kentucky when he decided to sell them off and make a business out of his newest love, jerky. The Wild Joe brand has seemingly built itself around its logo, a cartoonish scruffy-looking old man with round spectacles and a beard, resembling something like a cross between Benjamin Franklin and Colonel Sanders. 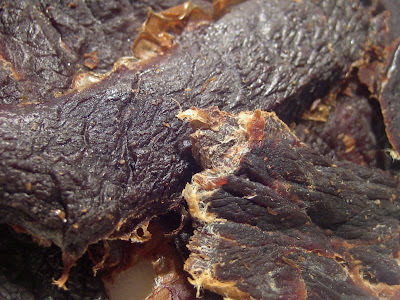 The brand focuses on thin sliced jerky, free of preservatives. Since it's start in 1990, the company has done pretty well, with its products sold in some 1,000 stores across the USA. Beef, water, soy sauce, salt, smoke flavoring, garlic powder, black pepper. The predominant taste I pick up off the surface is a soy-sauce flavor. With some chewing, I can pick up the natural meat flavors, and more of the soy sauce, while the saltiness gains in strength. The soy sauce flavor is very prevalent in this jerky, I'd say it dominates the overall taste. And with a strong soy sauce flavor, you tend to get a lot of salty flavor too. After eating through two of these 0.8oz bags, I do feel a salt scorching on my tongue. The natural meat flavors probably have the second-most dominant taste. It's not a strong flavor, but it's clearly discernable, and provides me with enough taste to provide that enjoyment of eating beef. It may be somewhat masked by the stronger soy sauce flavor. For being free of preservatives, I didn't find any kind of stale taste. While the ingredients list goes on to name smoke flavoring, garlic powder, and black pepper, I don't really pick up much from them, except just subtle hints. I can tell there's some garlic and black pepper in this from the aftertaste, but it's not a strong aftertaste. I'm not sure I pick up any of the smoke flavoring, but then again it may be masked by the soy sauce. Overall, this natural variety from Wild Joe's provides a great dose of flavor in each bite, mostly as soy sauce, salt and natural meat flavors. These appear to be slices of whole meat, sliced thin, and in small, medium, and large pieces. 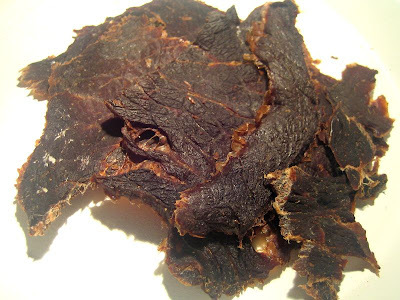 It's a dry jerky that still retains some flexibility, but will crack and break if bent far enough. Because of its thin, dry nature, you can tear off pieces pretty easily, and it seems to chew fairly easily too. Once a piece hydrates in my mouth, it provide a chewing experience similar to a real steak. I also found the pieces to be rather clean; I didn't get residue on my fingers. One of the pieces had a decent amount of fat marbilization, while the others look to be pretty lean. I found no other connective tissues in the form of tendon or gristle. Wild Joe's sells this natural variety from its website at a price of $9.00 for a 3.5 ounce bag, which works out to a price of $2.57 per ounce, putting it in the expensive price range. 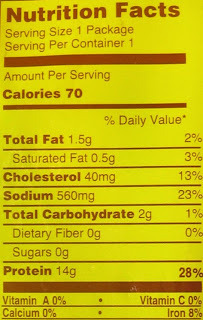 You can also buy it in an 8 ounce bag for $1.88 per ounce, which gets it down into the average price range. For general jerky snacking purposes, this provides a fair value if you consider the high $2.57 price per ounce. It gives off a good snackability with its strong taste, and great meat consistency. If you consider the lower $1.88 per ounce price at the higher quantity, I'd give it a decent value for general jerky purposes. For being the company's plain variety, this offering from Wild Joe's offers a lot of taste in the form of soy sauce, salt, and natural meat flavors. Combined with its ease in tearing and chewing, it provides a great snackability. But beyond that, I didn't find much else to warrant a higher rating. I would normally give a higher rating for providing a strong natural meat flavor, but this only provided a fair amount, second to the more dominant soy sauce flavor. I also found this to be quite salty after eating through several pieces, but on a piece-by-piece basis I don't find it to be all that intense. Overall however, it still does its job well as a snack food, though you'll likely want something to drink to rehydrate your salted tongue. And my recommendation for rehydration would be a light-tasting beer, like a honey blonde ale.